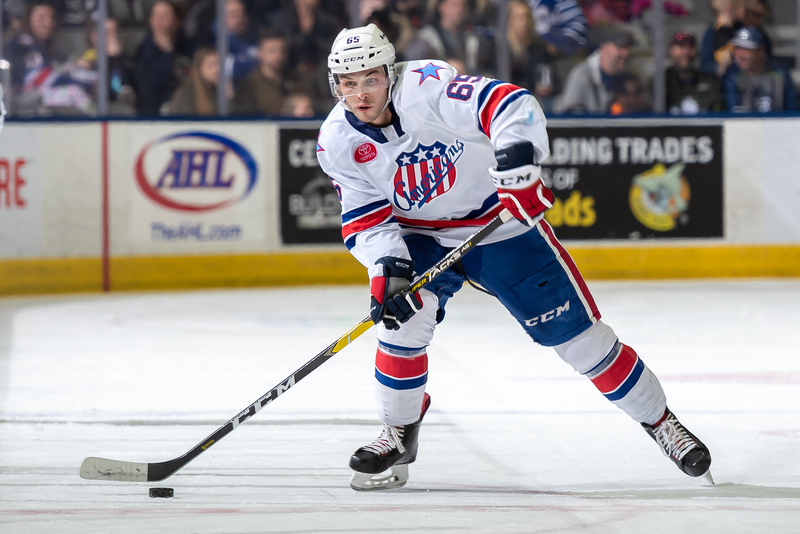 Danny O'Regan OT Winner Completes a Huge Comeback Win · Let's Go Amerks! The game on Sunday afternoon was a roller coaster that presented a lot of doubt in the first minute of the third period but this Rochester Americans team didn’t quit and will drive back from Toronto feeling a lot better about themselves. Dmytro Timashov scored just 38 seconds into the third period to give the Toronto Marlies a big 4-1 lead. Scott Wedgewood went to the bench and was replaced by Adam Wilcox. That appeared to be the game. Rochester was better in the first, Toronto was even better in the second scoring three goals and then what felt like the nail in the coffin at the start of the third. They never stopped playing, they just went into a big hole. Kyle Criscuolo scored with just 22 seconds remaining in regulation to tie the game and than Danny O’Regan capped off the big comeback win just 17 seconds into overtime. Here’s how the game played out.. The first period was dominated by the Amerks in pace of play, scoring chances, and shots. They had a 15-6 lead in shots after 20 minutes. It was an entertaining period from a Rochester point of view. Rasmus Asplund scored his eighth goal of the season at 12:56 with a one timer off a perfect cross ice pass below the face off dots from Victor Olofsson. Danny O’Regan had a secondary assist for working the puck along the back boards to Olofsson. Rochester also had two great penalty kills during the first. Twenty minutes of hockey doesn’t mean all that much when you’re out played in the following twenty minutes. Toronto showed up in the second period ready to play and scored three in the period to take a 3-1 lead. All three goals were scored around the face off circle to the left of Scott Wedgewood. A big hit by Veilleux in the offensive zone followed by what looked like a bad read by Dalton Smith lead to Marlies forward Scott Pooley scoring his first goal of the season. League leading scorer Jeremy Bracco found himself open on another goal as all five Rochester skaters were on the other half of the ice. Toronto took a 3-1 lead after a bad offensive turnover by Eric Cornel that lead to a Toronto rush down ice and Pierre Engvall found himself in a similar spot and scored. Rochester showed some life again in the last four minutes of the second period and had at least four scoring chances but shots went wide or off the post. As mentioned above, Toronto started the third strong and Dmytro Timashov scored just 38 seconds into the third period. He was open just above the hash marks with a goal that Wedgewood would probably love to have back. CJ Smith scored his 25th goal of the season to start the comeback at 6:07 of the third by scoring a goal from behind the net. It was tough to see but either went off a Marlies stick or off the arm or back of goalie Kasimir Kaskisuo. With less than seven minutes to play Rasmus Asplund scored his second goal of the game in similar fashion to the first. Danny O’Regan cleared the puck around the back wall, Victor Olofsson sent a cross ice pass to Asplund who scored a one timer. Adam Wilcox went to the bench for an extra skater down by only a goal and Kyle Criscuolo scored a massive goal, just his sixth of the season, to tie the game at four with just 22 seconds left. Criscuolo won the face off back to Olofsson, he passed it across to O’Regan and the shot by O’Regan was tipped by Criscuolo. Clutch face off win when it was needed. The comeback was a mix of Rochester continue to push forward in the game and Toronto appearing to play on their heels. The change in goaltending also helped change things up. Chris Taylor sent out three forwards to start overtime and those three forwards were Victor Olofsson, Rasmus Asplund, and Danny O’Regan. The line of the season. After winning the face off into the defensive zone they set the play up and O’Regan caught the Marlies flat footed and went right in on net. Asplund and Olofsson each had an assist. Huge come back win for this Rochester team to save the weekend and finish the weekend sweep over Toronto. Lawrence Pilut was called up earlier in the day by the Sabres. Nathan Paetsch went into the lineup in his place. Zach Redmond is still on the injured list. If Pilut or Redmond had played they likely would’ve been on the ice during those last two scoring plays. Without them the team doesn’t have a scoring defenseman so they went with all forwards.